If you’ve been with your ESP for a while, it’s possible that the relationship has gotten…comfortable. You used to talk about deeper subjects, but now it’s all the day-to-day grind of campaigning, making and sending emails. Sound familiar? If so, it is wise to schedule some time with your ESP and reconnect on that more impactful level that you used to. How many subscribers are you looking to add this year? What are your open and click-through rates now, and what should they be? What’s your plan to reduce unsubscribes? But it becomes more interesting if we talk about the business goals. How is your target audience shifting? What should the (ideal) customer journey look like? Are we meeting customer loyalty and satisfaction levels? It is about the ways to grow your business this year, and envisioning how your email program can contribute to that growth. Your ESP can’t help you with realizing your strategic goals if they don’t know what they are. Sharing those goals with your ESP – in a provocative manner – should generate a constructive conversation that will drive action and points towards understanding how they can better assist you. 2. Lay out the plan to help achieve those goals. If you’ve hired an enterprise-level ESP, you should be using their expertise to improve your business; otherwise you’re missing a golden opportunity. Email service providers have tons of experience with a variety of clients – if nothing else, they should have some ideas they’ve seen other clients try that might work well for you, or some new features on their roadmap that they might want to prioritize once they know you need it. For example, maybe there’s email reporting that would make your life easier that your ESP could put together for you. 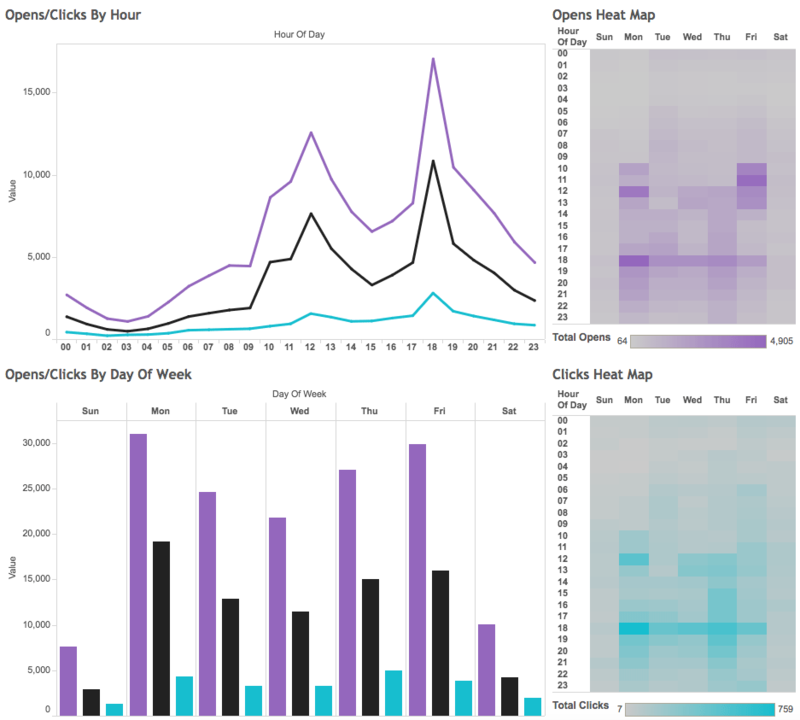 Stats reporting can be customized if only your ESP knows about it. We had a client, Golf Channel, who was spending too much time pulling & cleaning reports for advertisers. It was overwhelming their team. We created a custom report for them. Then it took 5 minutes to produce and send the report instead of 45. You’ll never know all the ways your ESP could help you until you ask. Ask your ESP what you should be doing that you aren’t doing yet. It might be difficult to keep track of every new feature and options that an enterprise-level ESP has available for your program. 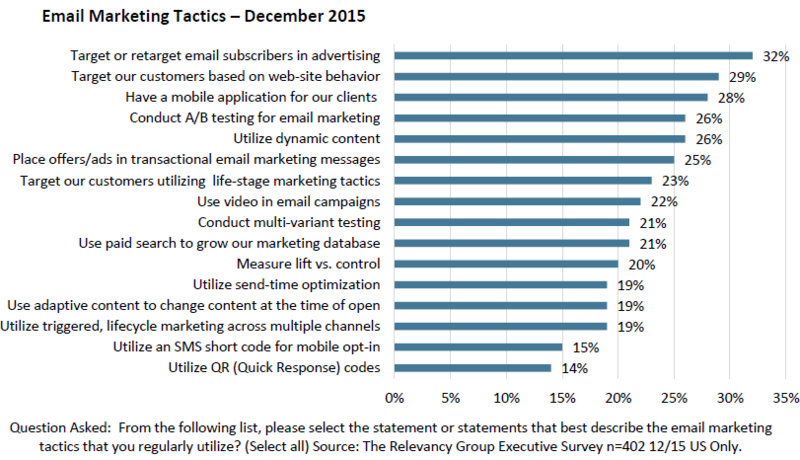 According to The Relevancy Group‘s 2016 Executive Survey, many email marketing tactics are not being implemented. Not because of a lack of tools but instead due to a lack of time, staff and access to data. Don’t let your own busyness get in the way of results. Your ESP knows their capabilities better than you do, so once they know your goals, see if there’s a lesser-known or unused feature or creative use that can lift your program results. 4. Share Your Ideas and Frustrations. No ESP can fix what they don’t know is broken. Tell them what’s slowing you down and present ideas on how to remove those obstacles. The squeaky wheel gets the roadmap prioritization. An enterprise-level ESP shouldn’t just be some piece of software you bought. It should be an ongoing partnership that brings maximum value to your business. Share your strategy and ask them for help with it. And if those conversations don’t lead to positive change for your business, it might be time to have those conversations with a new ESP.